The first and the oldest type of steel used as structural steels are plain carbon steels. The increase in strength was based on increase in carbon content. Carbon in Fe is a solid solution, with limited solubility. 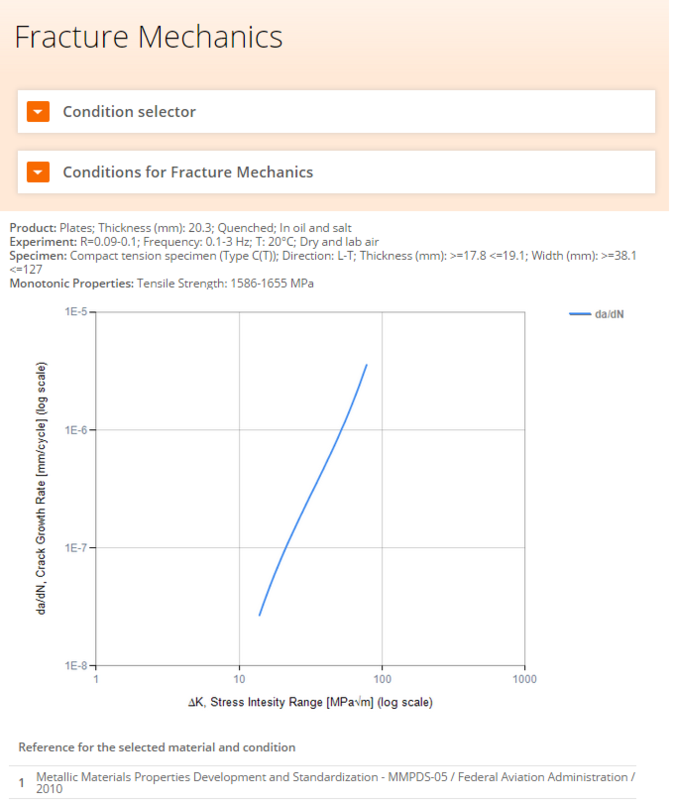 During deformation, as a result of applied stress, dislocations through their movement interact with obstacles, what in turn requires increase of applied strength for further deformation. It is clear that the increase of carbon content increases transition temperature and lowers the upper shelf of impact toughness. In these steels, the microstructure depends on carbon content, and is mainly feritic or feritic-pearlitic, and in some cases even bainitic. The first and the oldest type of steel used as structural steels are plain carbon steels. The increase in strength was based on increase in carbon content. Carbon in Fe is a solid solution, with limited solubility. During deformation, as a result of applied stress, dislocations through their movement interact with obstacles, what in turn requires increase of applied strength for further deformation. Influence of carbon content on transition temperature in carbon steels is shown in Figure 2. 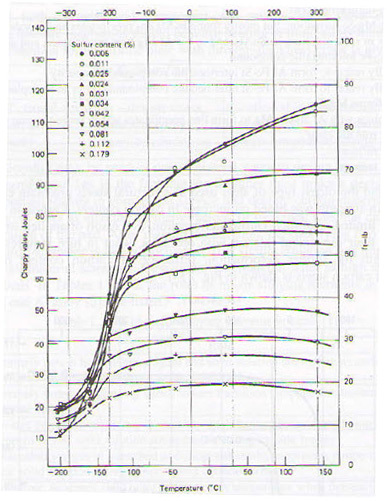 Figure 2: Influence of carbon content on the transition temperature of steel. Increase of carbon provides increase in carbide fraction. Carbides (cementite) are elongated with very sharp tips; they act as stress concentrators, thereby decreasing toughness. Due to the relatively low level of production technology, it hadn’t been possible to remove sulfur and phosphorus from the steel matrix during processing. Sulfur forms a low melting eutectic with Fe, distributed as a thin film on grain boundaries, leading to fracture. Influence of sulfur content on the transition temperature in carbon steels is shown in figure 3. 3) enormous weight of the construction itself. Also, in steel with more than 0.8% C cementite is introduced, which can in some cases lead to the formation of carbide net, characterized by very sharp edges behaving as stress concentrators. 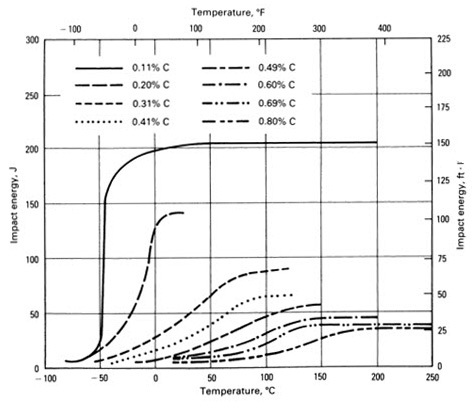 Figure 3: Influence of sulfur content on the transition temperature of steel. As it can be seen from Figure 2, for structural components that require improved mechanical properties (higher toughness), only low carbon steel can be used, but its strength is relatively low. Therefore, larger cross sections should be used, what in turn leads to increase in weight of the construction and introduction of a third stress component. To overcome these problems it was necessary to produce a new type of steel, C-Mn steels. Introduction of manganese had several roles: formation of sulfur containing inclusions, additional solid-solution strengthening, and lowering of the carbon level in steel, i.e. the carbon equivalent. Manganese is substitutionaly soluted in Fe, but the effect on strengthening is not significant, since it depends on the difference in atomic size and Mn and Fe are neighboring elements in the periodic table. In structural steels, the content of Mn is in most cases limited to 1.5-1.75%, because larger content leads to increase of Ar3 temperature and nucleation of pro-eutectoid ferrite. In other steels, the manganese content may be as high as 12%. The influence of manganese on the transition temperature in C-Mn steel is shown in Figure 4. 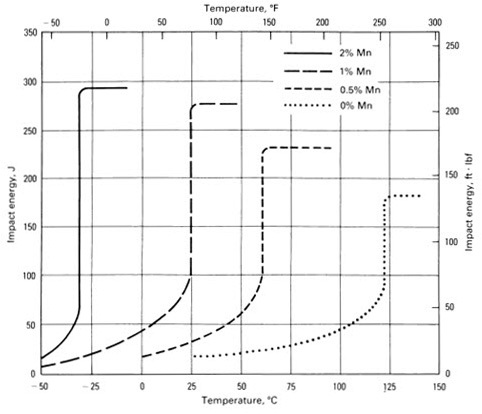 Figure 4: Influence of manganese on the transition temperature in C-Mn steel. The increase of manganese content decreases transition temperature to very low values, the main mechanism of which being the formation of manganese-sulfide (MnS). Manganese and sulfur have strong chemical affinity, leading to spontaneous formation of MnS inclusions during the solidification of steel. So, the simplest way to completely remove sulfur from the solid solution is the addition of sufficient amounts of manganese. The application of manganese ensured significant increase of toughness of low carbon steels, with exceptions in some medium carbon quenched and tempered steels. During further metal working, MnS inclusions can become elongated (rolling) or fractured and dispersed (forging). The presence of long MnS inclusions in as-rolled steels is very dangerous, since the edges behave as stress concentrations, leading to fracture or to lamellar tearing in welded structures. The next task was to eliminate sulfides as critical particles. The solution was additionally alloyed with calcium or rare earth elements (RE). This improvement was directly based on the knowledge provided by fracture mechanics, i.e. addition of calcium primarily influences the shape of MnS. This feature is shown in Figure 5. Figure 5: Shape of MnS after rolling (RD-rolling direction): a- no Ca added; b-addition of Ca. Another problem for steel producers was the presence of free oxygen, originating from air blowing into converter or furnace. In order to eliminate oxygen it was necessary to modify the chemical composition by adding a specific chemical element with strong affinity to oxygen. The answer came from the diagram of stability of oxides. Silicon or aluminum have been applied in an amount calculated from the chemical composition analysis during the steel production (ladle analysis after converter). This procedure introduced a new type of steels, so called killed steels, since the oxide formation prevents bubbling of the liquid metal. The addition of aluminum has become increasingly interesting since in some Al-killed steels the precipitation of AlN occurred at grain boundaries, thus decreasing grain boundary mobility. This was observed in steels in which Al was added in high amount: air-blowing (instead of oxygen, nowadays) led to reasonable presence of nitrogen and strong affinity between Al and N.
Total Materia Extended Range includes the largest database of fracture mechanics parameters for hundreds of metal alloys and heat treatments conditions. K1C, KC, crack growth and Paris law parameters are given, with the corresponding graph of crack growth. 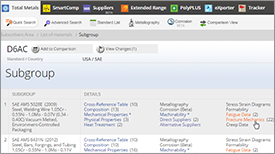 Monotonic properties are added for the reference, as well as estimates of missing parameters based on monotonic properties where applicable. 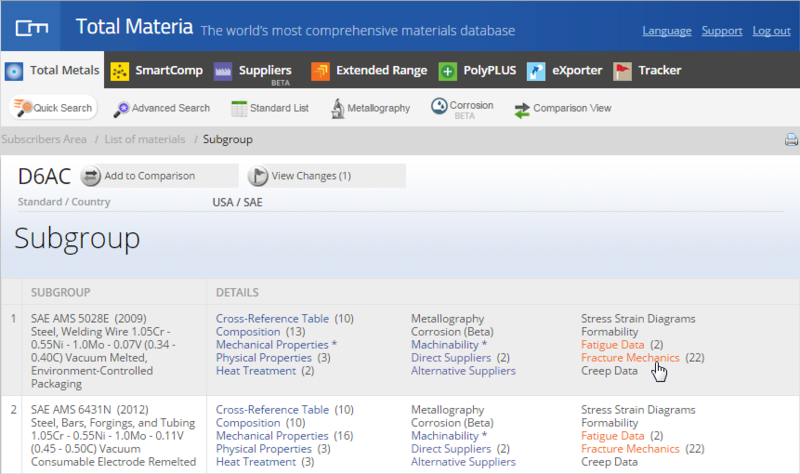 After clicking the material from the resulting list, a list of subgroups that are standard specifications appears. 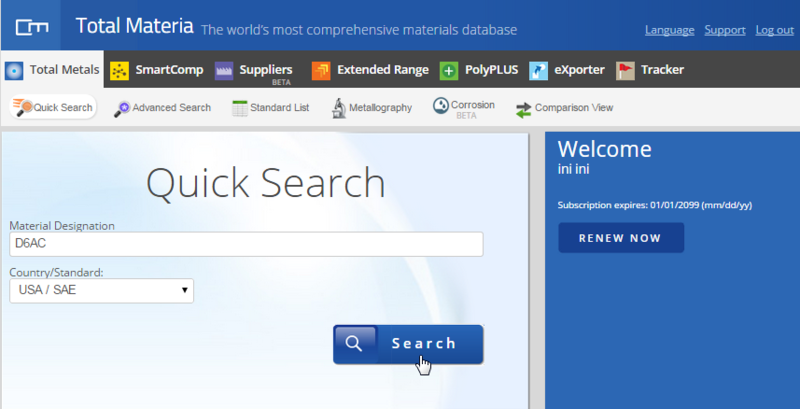 Because Total Materia Extended Range fracture mechanics parameters are neutral to standard specifications, you can review fracture mechanics data by clicking the appropriate link for any of the subgroups. 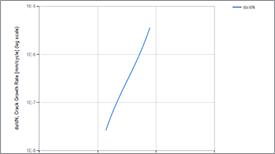 The data are given in a tabular format, with the Paris curve (Region II) where applicable. 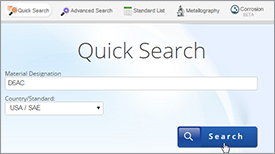 Explicit references to the data sources are given for each dataset.